With the signing of Eric Hosmer in the winter, the San Diego Padres had a lot of excitement about the 2018 season. Though Hosmer did not have a great year, some of the position players around him did. Here are their grades for the season. The final end-of-season grading article from EVT will focus on the most polarizing group of the 2018 Padres squad–the position players. There’s some good, some bad, and a whole lot of in-between to be found here. As is consistent throughout this series, the grading system will primarily emphasize pure on-field production, but will also take into account preseason expectations, availability, and improvement as the season progressed. Asuaje struggled mightily for an overwhelming portion of 2018. He entered the year with the goal of building upon a solid rookie season, but never really found a groove and now appears to be firmly behind Luis Urías on the second base depth chart. For someone with little-to-no pop and underwhelming defensive tools, he struck out far too often (21.1 %), and a move to third base looks like his best option to see consistent playing time in 2019. However, limited arm strength and light hitting don’t typically play well at third, so Asuaje is definitely in a tough spot moving forward. Cordero, owner of ridiculous physical tools and an equally ridiculous strikeout rate, showed far more good than bad in 2018 before an elbow injury abruptly ended his season. His power-speed combination is not something you find often in any baseball player, let alone someone who plays for the Padres, and he’s only 23. Statcast tracked him in the 93rd percentile in the entire league in terms of sprint speed, and his 489-foot bomb back in April stood as the longest in the Majors until a Coors-assisted, 505-foot dinger by Trevor Story changed that in early September. He isn’t without his flaws, however; striking out 35.7% of the time is horrendous and he oftentimes struggled with his outfield reads off the bat. Improvement in these two areas in 2019 will absolutely force his name into the Padres lineup every night, and potentially an All-Star lineup in July. Ellis didn’t do anything spectacular this season, yet he still managed to exceed all expectations. We know about his veteran leadership–Austin Hedges is on record as saying his relationship with Ellis has been crucial in his own development as a catcher–but he also swung a surprisingly decent bat in 2018. There’s not much more you can ask for out of a backup catcher, so a B+ relative to expectations feels about right here. 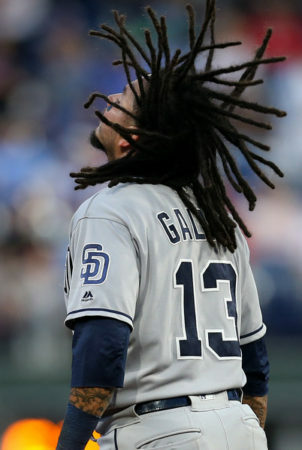 I’ve raved about Freddy Galvis on this site before, and I’m going to do it again right here. I think he was the Team MVP in 2018. There’s not a better defensive shortstop in the game, and although not known for his bat, he was more than serviceable in that department. Much like Ellis, Galvis came to San Diego with loads of knowledge readily available to young infielders, and also similar to Ellis, his teammates have raved about his role in their own development. He hasn’t missed a game in two-plus seasons (that’s a league-best, by the way) and placed third on the team in RBI behind middle-of-the-order hitters Eric Hosmer and Hunter Renfroe. I won’t get into his 2019 future here because that could be an entire article in itself, but please, give this man a Gold Glove. Please. Hedges showed significant improvement at the plate in 2018. Decreased strikeout rates, increased walk rates and slash-line improvements across the board are undoubtedly signs of a maturing hitter, but he still has a ways to go to be considered an everyday catcher on a good team. Although Francisco Mejía’s arrival at the trade deadline complicated the future for Hedges, and a trade is still very possible, his top-tier defense and improving offense made the 2018 season a promising one for number 18. Expectations really hurt Hosmer’s grade here. Objectively, his numbers are certainly above league-average and probably deserve higher than a C, but for $20 million, that’s not going to cut it. Advanced metrics liked his defensive output this year far more than in 2017 (eight Defensive Runs Saved in 2018 compared to negative seven in 2017) and he was by all accounts very popular in the clubhouse. He led the team in RBI and actually had a pretty solid start to the season, but let’s not kid ourselves here. Hosmer has to be better in 2019. As the grade would suggest, Jankowski was good, not great, in 2018. 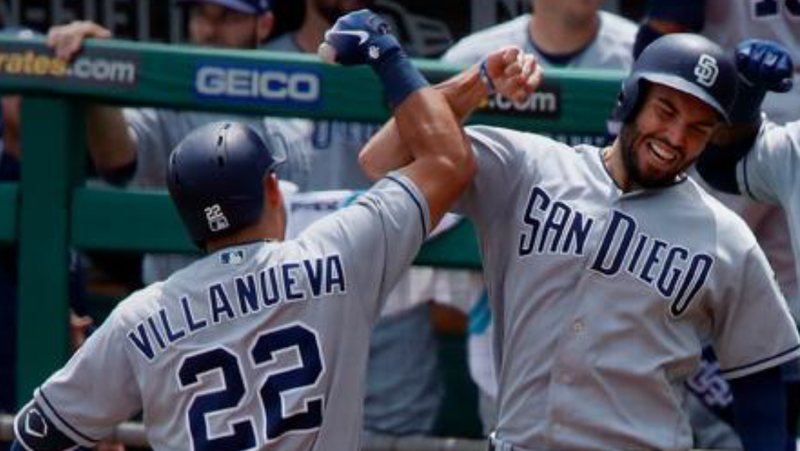 Injuries and overall chaos in the outfield yielded plenty of opportunities for Jankowski, who responded by stealing 24 bases and leading qualified Padres hitters in batting average. There were times during the year when he appeared to be the most impactful offensive player in the lineup, but his obvious limitations with the bat probably don’t set him up well for a starting spot in 2019. His speed and defense will always play well as a fourth outfielder, but I wouldn’t count on Jankowski starting 78 games next season. Lopez filled in admirably for injured catchers, but truthfully, he didn’t have much impact on the 2018 Padres season. He struck out at Franchy Cordero levels without any of the mouth-watering tools to compensate, and at 30 years old may never become a starting-caliber catcher in the league. I like Raffy Lopez, I really do, but I wouldn’t expect him to be back with the Friars in 2019. Hosmer just takes up a position, where someone else might be much more able. Even more so regarding myers. Look at WAR. Hosmer gets -0.1 WAR. Look at wRC+, where Hosmer scores a 95. How can that not be an “F” year? Playing every day and sucking is not exactly a point in his favor. Galvis: Wow. I like Galvis, but have you watched Andrelton Simmons? They aren’t even close. Asuaje: moving to 3b? Not a chance. This guy will be DFA’d and taken off the 40 man roster. Hosmer: I almost stopped reading here. You are out of your mind if you don’t give the Ground Ball King an “F”. And please, be more diligent. Comparing Hosmer’s numbers to a league average that includes pitchers and glove first catchers and middle infielders is disingenuous. Compare his numbers to other 1bmen and he rates a failure. Plus for his refusal to change his swing angle to hit the ball in the air more often he rates a special citation. Something like “player most likely to be cut if salary was of no concern”. Pirela: I can leave a refrigerator out near 2b, then wheel it out to LF. Does that make the fridge defensively versatile? Villanueva: you must be watching a different game than I do. His OPS against lefties, in only 113 ABs, was 1.118 (!). His OPS against righties, .574. On what planet are these legitimate numbers? Rather this is a role player. RH bat off the bench, sometimes 3bman when Myers needs a day off or is moved to 1b when a lefty pitches. Your thoughts on Galvis, Asuaje, Pirela and Galvis seem to be a difference in opinion, so I don’t have a problem with anything you said there. But regarding Hosmer…I stated in the first paragraph that these grades were on a league-wide scale. I’m not going to then change that and rate Hosmer relative to first basemen only. He was not good, but to think he deserves an F is just not accurate. And to say he would get cut if his salary was of no concern…also not accurate. He played every day and hit in the middle of the order. He’s far still far and away the best option at first base on the roster. Pirela I see as about as average as it gets, hence the C-. For Margot and Myers, it’s certainly possible that I was too generous. It’s worth noting though, that Margot ranked as the 7th-best outfielder in the entire league in Outs Above Average. That’s got to count for something. 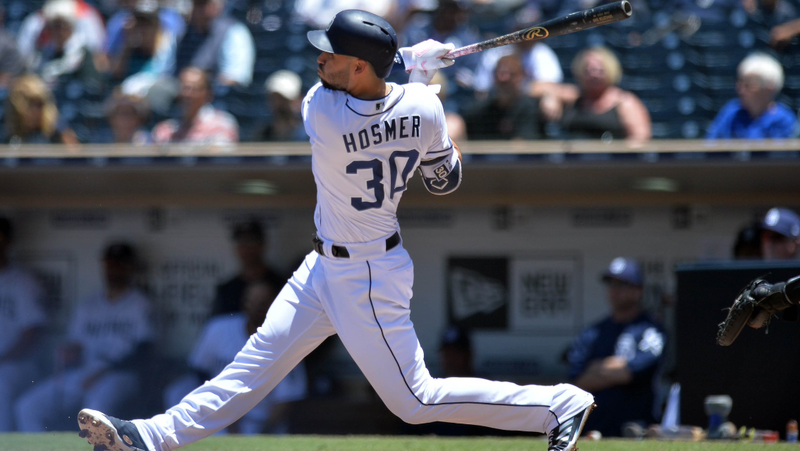 “Expectations really hurt Hosmer’s grade here.” Ugh, this is so frustrating. There is such a lack of objectivity. Can we not just blame “expectations”? Can we not just say, “Hosmer is just not that good”? So, to say “his numbers are certainly above league-average” is far from reality, and to say “certainly” further decreases your credibility … and you also start this off by saying “Objectively”?! I appreciate your work Brady, as well as this article, but please don’t be a Hosmer apologist (or” basher”), just be objective and accurate. 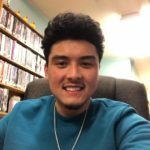 As for your perceived lack of objectivity regarding the expectations factor…I stated in the first paragraph that these grades take into account expectations, availability and improvement in addition to pure on-field production. Also, I’d like to see the link to that FanGraphs article you’re referencing. It brought up his .253/.322/.398 slash line, citing it as below league average. The league average slash line for 2018 was .248/.318/.409. His slugging is obviously down because he just didn’t hit the ball in the air, but that, to me, still looks to be above league average. It also, in the same sentence, cites wRC+, so which stat is that article actually referencing? Either way, still appreciate the love. I know you comment on almost every article. The grade is not my concern. It is the accuracy and objectivity, or lack there of. Are you still standing by the declaration: “his numbers are certainly above league-average”? His numbers were not average, not clearly above average, but “below average” … as is a negative fWAR. Also, for what is worth, and when it comes to accuracy, you might have me confused with Tanned Tom. I do comment, but only on a select few articles.